Speaking at the funeral of Mr. Hollings, the former South Carolina senator who died this month at 97, Mr. Biden hailed his longtime friend and former colleague, a one-time segregationist, as the embodiment of this state’s growth. Mr. Biden’s trip here marked his first visit to an early nominating state this year and came just a week before he is expected to make his long-anticipated entry into the Democratic presidential primary. His somber appearance at The Citadel, South Carolina’s storied military college and Mr. Hollings’s alma mater, was not the 2020 debut the former vice-president and his aides were planning. But his eulogy underscored Mr. Biden’s deep ties to this pivotal state with its high percentage of black voters — and the promise and peril of his candidacy. Mr. Biden once described Mr. Hollings as his best friend in the Senate. And as he recalled in strikingly subdued tones Tuesday, it was Mr. Hollings and his late wife, Peatsy, who helped convince him to remain in the Senate when his wife and daughter were killed in a car accident shortly after he was first elected in 1972. “Aside from my family, the first people to bring me back from that black hole I was in were Fritz and Peatsy, that’s not hyperbole,” he said. That friendship is what first brought Mr. Biden to South Carolina, where Mr. Hollings would introduce him to many of his political allies. Eventually, Mr. Biden began vacationing in the state, usually staying on one of the barrier islands near Mr. Hollings’s native Charleston. The relationships Mr. Biden developed here now form the nucleus of his support network in the first-in-the-South primary state. Those connections were on vivid display as the former vice president stood before hundreds of mourners in the cadet chapel. It was an audience that included scores of influential state and local Democratic officials such as Representative James Clyburn, a fellow eulogist and the highest ranking African-American in Congress. The funeral reflected the era of the man his admirers had come to honor, with gray hair filling the pews and sepia-toned memories flowing from the pulpit of a lawmaker who was first elected to office in the aftermath of World War II and retired from the Senate 15 years ago. Such older voters here and beyond make up the core of Mr. Biden’s initial base, early polls indicate, and are the sort of reliable participants in primaries that candidates covet. 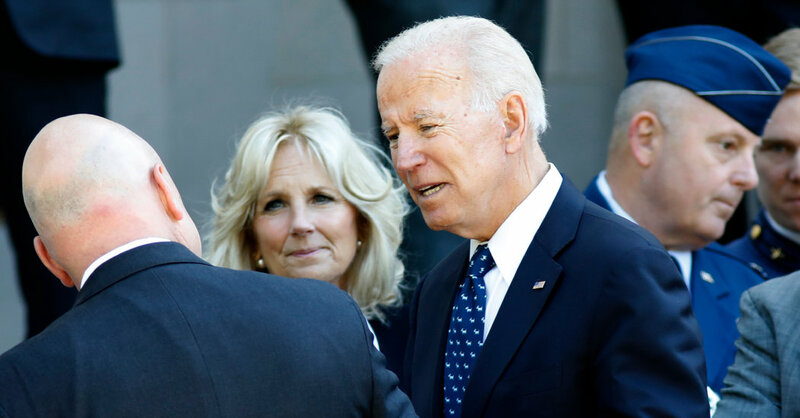 Former Charleston Mayor Joseph P. Riley Jr., for example, attended the service and said in a brief interview that he intended to support Mr. Biden. But as the former vice president extolled an earlier, less rancorous political era in his tribute to Mr. Hollings, the challenges he will face in this coming campaign were also difficult to miss. Younger Democrats have little personal connection to Mr. Hollings and those that are aware of him recall that he began his career, like many other white politicians of his generation in the South, as a segregationist. Mr. Biden, who is himself facing intense questions about his 1970s opposition to school busing, handled Mr. Hollings’s evolution on race delicately in his speech, referring only obliquely to the late senator’s earlier support for segregation. “He was constantly evolving,” said Mr. Biden, standing before a Citadel choir featuring black and white members. It fell to Mr. Clyburn to speak in more detail about how Mr. Hollings went from defending “separate but equal” as a young legislator to eventually telling state lawmakers that “we have run out of courts” and supporting the integration of Clemson University. “Thank God a man can grow,” said Mr. Clyburn, his voice breaking. Neither he nor Mr. Biden mentioned the fact that the Confederate flag was raised atop South Carolina’s capitol dome in 1961 when Mr. Hollings was governor. The flag would remain on the statehouse grounds until 2015 when it was finally removed in the aftermath of the racist killing of black parishioners at Charleston’s Mother Emanuel church. Mr. Hollings was elected to the Senate in 1966, a year after the Voting Rights Act secured the franchise for African-Americans in the South, and would rely on black votes throughout his career in a state that eventually become a Republican bulwark. In 2015, a federal courthouse in Charleston was named for Mr. Hollings. But, as Mr. Biden noted, he rejected the honor and asked that it be named instead for J. Waties Waring, a local federal judge and lonely voice for integration in the Civil Rights era. Mr. Biden was not the only former senator in attendance: former Secretary of State John F. Kerry and former Senator Christopher J. Dodd both came to pay their respects.